The Census Bureau of the Department of Commerce reported results for US E-Commerce 2017 Q1. 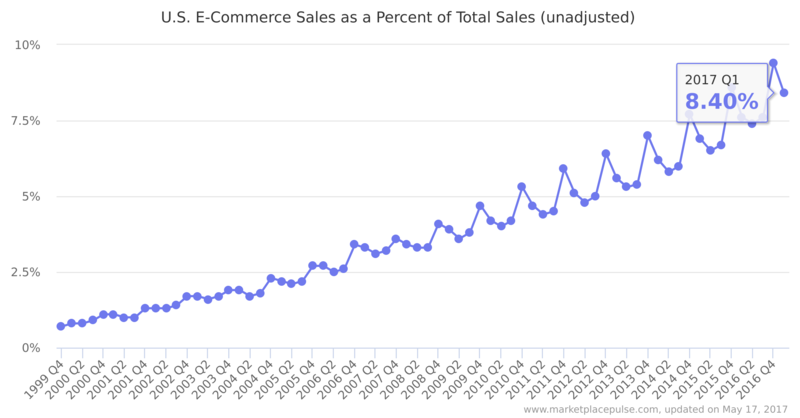 E-commerce sales were $98.06 billion, up by 14.8 percent from a year before. We estimate that Amazon’s share of US e-commerce is at least 43 percent, rising every quarter. Total retail sales reached $1,163 trillion during the quarter, a 3.7 percent increase from $1,122 trillion a year ago. This means e-commerce accounted for approximately 8.4 percent of total retail sales. Last year it was 7.6 percent, as e-commerce continues to grow faster than traditional retail. However, e-commerce share is likely considerably higher - total retail sales include sales of items not sold online, like automobiles and fuel. This underplays the share of e-commerce, which we thus think is at least 10 percent. Internet Retailer estimates it at 12.4 percent for the last quarter, 4 points higher than the Census Bureau figure. Furthermore with $307 billion domestic sales last year across its 4,700 locations Walmart represents one tenth of US total retail. Top 10 US retailers alone, which include Walmart, Costco, and The Home Depot, make up one fifth of US retail. Almost 40 percent of US retail is generated by top 100 retailers. Yet many of the categories these retailers are in are not big online yet. Groceries alone is just starting to grow online. Most categories have much higher e-commerce penetration than the 8.4 percent figure. It is hard to estimate the true size of retail for any particular category, but it is a mistake to consider total retail sales as a representative number. Historically retailers were dismissive of online sales, often assuming customers wouldn’t shop online for their niche products. Today this is happening in clothing, where despite common belief that buying clothes requires in-person visit to a store, online sales are skyrocketing. Retailers tend to react once their sales start to decline, but by then online retail has reached the tipping point. We wrote more on this in Struggling Retailers Blaming Amazon Are Missing The Bigger Picture. It is a mistake for traditional retailers to not participate in online retail too as it is much bigger part of their market than the numbers suggest. Like most statistics, a single number like e-commerce share of US retail masks the vast complexities of the market.